They are finally going to replace my windows. No big deal. That has been the plan all along and the replacements will look like the old ones but meet modern energy standards. The only thing is, all these barely worn and rotting window frames — they are only 155 years old, after all — are about to be thrown out. I needed to keep at least one pair, just as a point of reference. But which one, where and why? Well. As I was nattering about this, we decided to move the ground floor WC. Fanatic readers will recall that we removed the service stairs. The freed – up space became a sort of utility chase, especially useful for the euphemistically named sanitary waste. So we joined fixture to drain, making installation easier and improving the proportions of the utility room. Excellent, but now the WC has no window. Eew. Except that now it does. Kieron and Eddie removed the dog/mud/utility room window and set it into the adjacent wall. I think I’m the only one that loves it. This is where the whole Blandings thing comes in. Now we have to replace some clear glass with frosted — curtains got the emphatic contractor thumbs – down — and reputty all of it. Then they will likely fill in all those rotten bits, then repaint. So no, the reused window isn’t actually free. A throne with a view! I think that’s more or less what concerned my contractors when we were discussing curtains vs. etched glass, though of course they were not thinking of the view out. The look on their faces was priceless. Do you think your drywall use has run into acres? I am assuming this is to cover layer of insulation, in every space or just outside walls ? How are you getting around the cornice retention thing? Oh no, oops. Let me try again on that. There are just over 4000 sq m in an acre. 500 m, every existing wall plus a few new walls plus a few replaced ceilings, um, dunno, but certainly something over half an acre. Oh. The cornice. The replacement cornice is on site. When I get a look at it, I’ll take a photo and do a post. The cornices are way cool. We have had an interesting relationship with what we call plasterboard, as have our friends in Brittany, Phil has done it all himself- mad like us- flickr photos on link below. Always interesting to see another project, their place is totally different to yours and mine (three years and counting on it so far), but Phil retired early so spends lots more time than we possibly can. How beautiful. It looks like Ireland. I could never do all the work myself. I have seen too many people burn out that way. He’s doing a beautiful job, though. 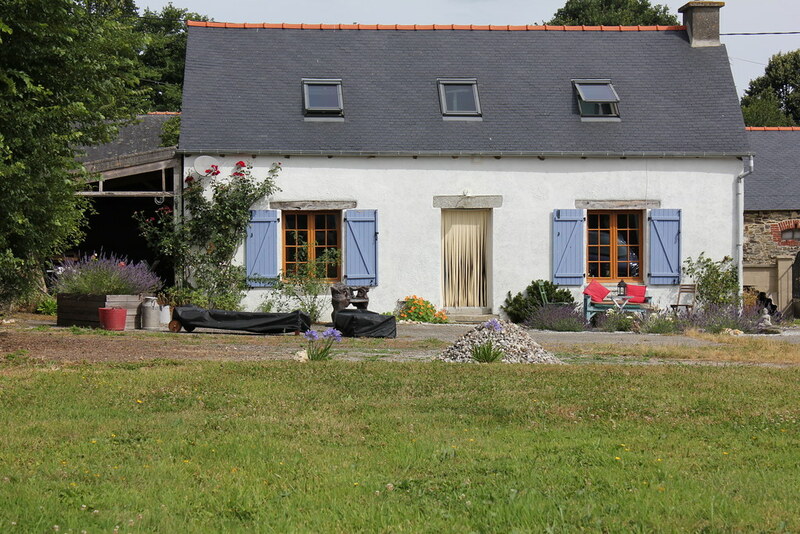 Easier for him because it’s basically Breton long house with ground floor and two bedrooms in the eaves.So access far . far easier to everything!! !Plus he has worked on other major restorations before. Because ours is incoherent, three storey and part medieval we haven’t attempted roofing, stone wall demolition, gas, plumbing, or electrics, installing windows or building roof terraces!! Yeah, when your house goes medieval on you, things can get hairy…J It gives him pleasure, that’s what is important. I get a lot more pleasure from a terrific book.